This post will cover 2 weeks worth of mail because from June 27th to July 3rd I was on vacation. -Exercise Stretch Band from the "Keep Moving Program"
Wow! That was a lot of stuff! Happy MM! I am following you from Mailbox Monday. I am also having an APRON GIVEAWAY going on. I will be having an Apron Giveaway once a month. Love free Victoria's Secret money! Oooo - love your samples. Happy belated Mailbox Monday. Wow! I am impressed at both your travels and your mailbox! I LOVE the Pyrex win! I own practically everything pyrex makes and can't live without them! Most of them are oven/microwave/freezer/dishwasher safe making them the most versatile dishes. I love to use the different size bowls to bake my cakes in and experiment! You can get so creative! 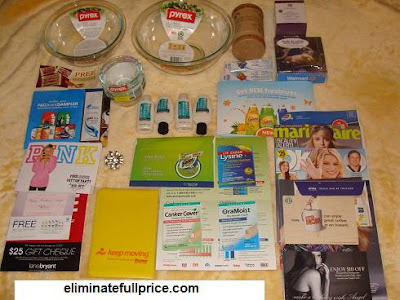 Mailbox Monday July 26th - Coupons galore! Mailbox Monday 7/19/10 - Zippity Ziploc!